Hiking Rocky Mountain National Park: Bluebird Lake in the Winter. 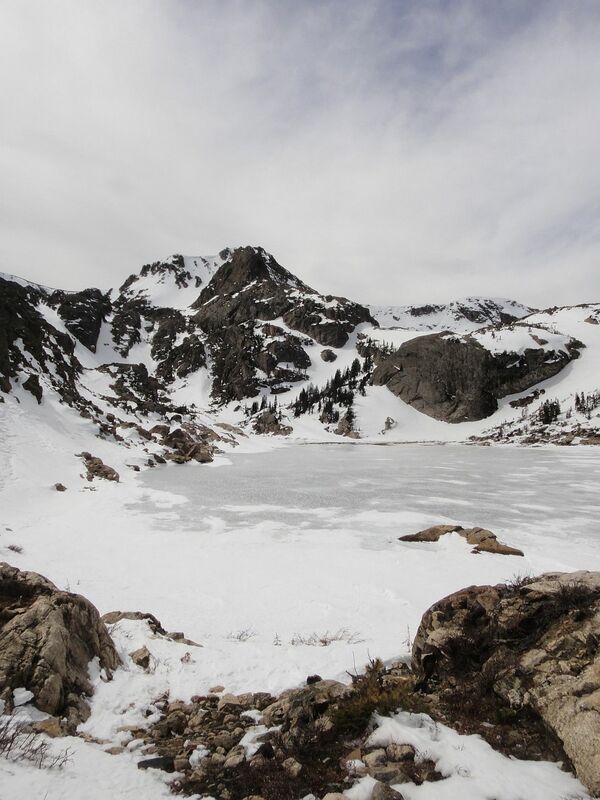 Bluebird Lake in the Winter. 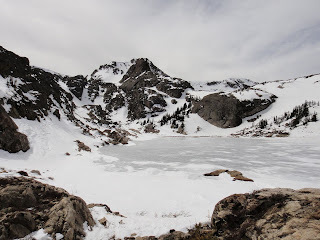 I had quite an adventure in the park this week, obtaining my only goal for the winter: Bluebird Lake. Here is some music to set the scene. Click play and listen while you read along. I got up at seven on Saturday, March 17 and was on the road by seven thirty. 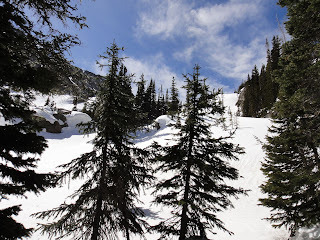 I arrived at Wild Basin around eight thirty and got my stuff together and started out. 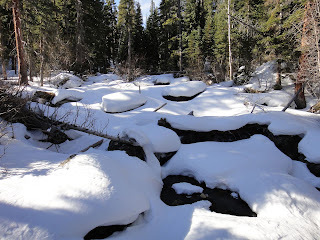 I noticed on the drive up that there wasn't much snow still around. In the park that is a different story. The day was very warm and the mile walk from the winter parking to the main trail head went by pretty quickly. Soon enough I had my winter jacket off and a lighter jacket on, and soon after that only a long sleeved shirt. 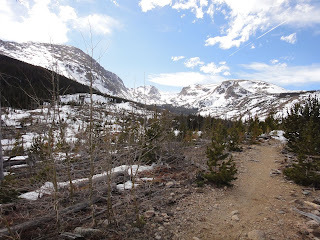 Thunder Lake trail was in pretty good shape. Packed snow most of the way up and therefore pretty well delineated through the trees. In fact, it wasn't until I passed Calypso Cascades that I put crampons on. 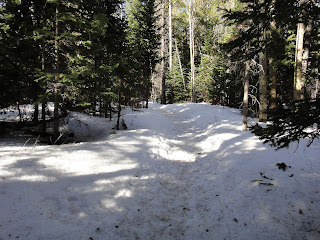 I didn't put my snow shoes on until I hit the intersection for Bluebird Lake trail, which was in much worse shape. Someone had went before me at some point and I was following their broken trail until it stopped, where I presume they turned around and went back. I looked at my surroundings and decided I needed to go up. And I did. 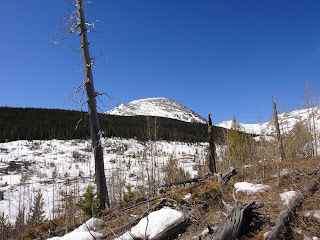 Soon I was on top of the hill and in the 1978 forest fire area that the trail heads through. 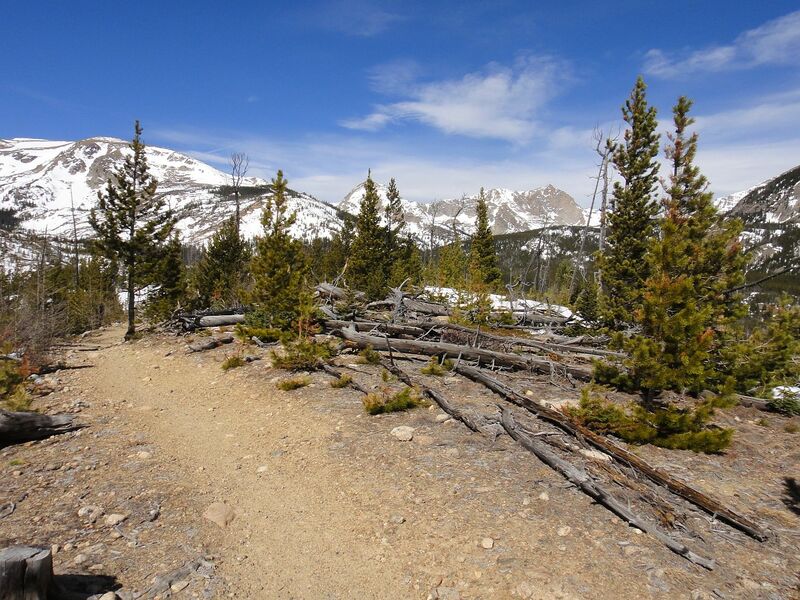 Without any trees to block the sun or wind, the trail was completely bare and visible in many places. Copeland as seen from the Bluebird Lake trail. Trail completely visible. Tanima and Alice in the background. 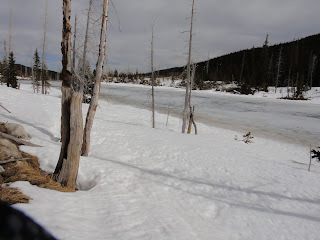 Here I was able to take off the snowshoes and walk for awhile. That was nice. 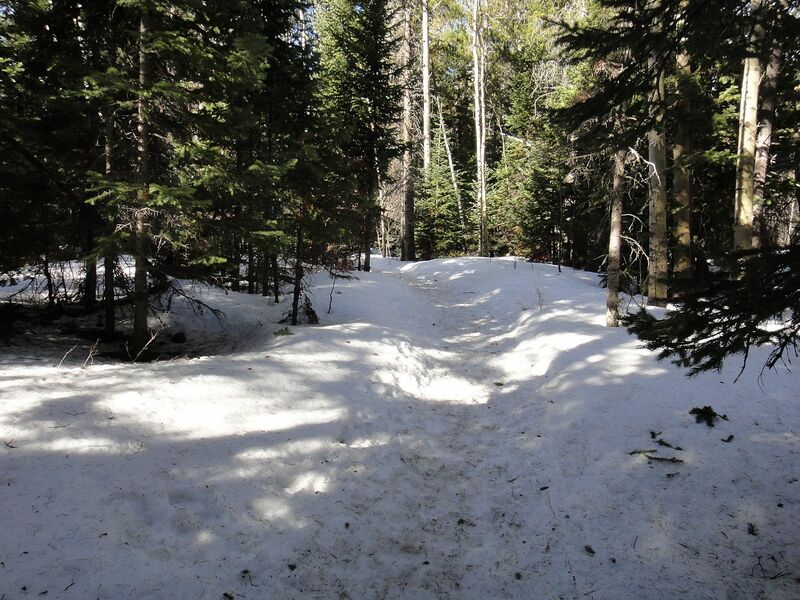 Once the snow cover started up again, it was pretty difficult to tell where the trail was precisely. I just did my best to think like the trail and figure out where it would be. I guess it worked! The sign marking the split for Ouzel Lake, buried. 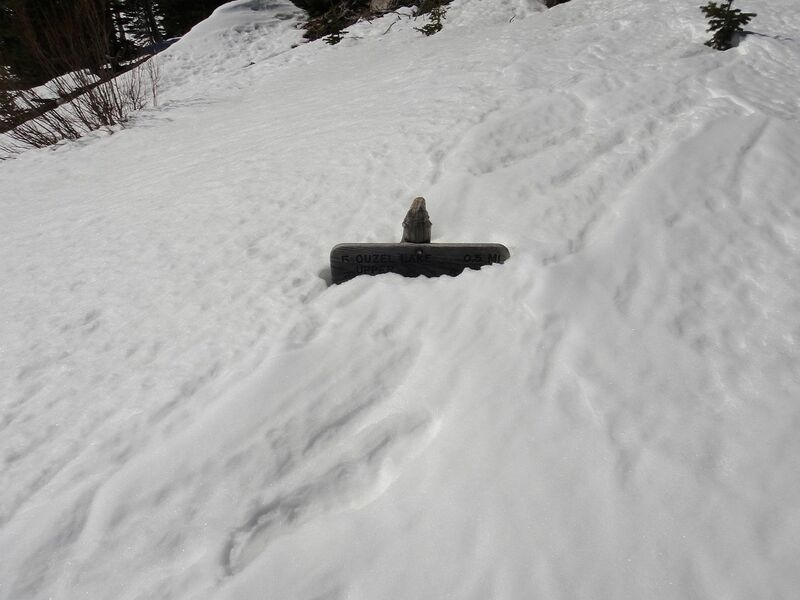 I took this picture to show the effects of wind on the snow. 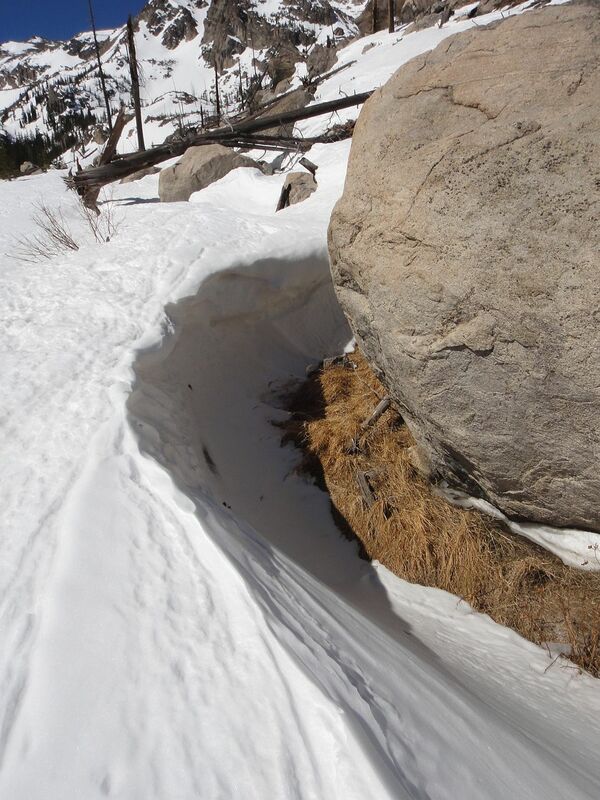 It is hard to tell from the perspective, but the snow here is about ten feet deep. The entirety of Copeland seen from Bluebird Lake trail. 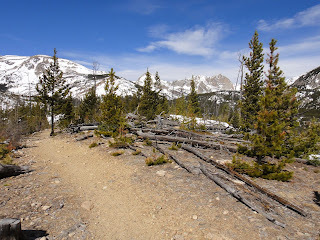 I was thinking that once I got past the forest fire area and back into some trees, it would be pretty easy to pick the trail up again. No such luck. The next time I 100% knew I was on the trail was only after I got to the lake and got back on the trail to head down. My familiarity with the area helped me out alot here. It is weird to have most visual references gone completely, and to have to rely solely on the surrounding peaks to guide you. 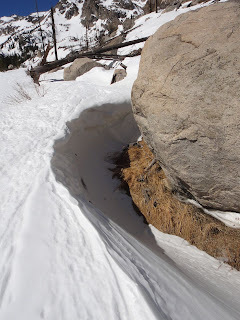 More steep snow. After passing the Ouzel Lake junction, you gain around 1000 feet in the next 2ish miles. This is how most of the afternoon looked. 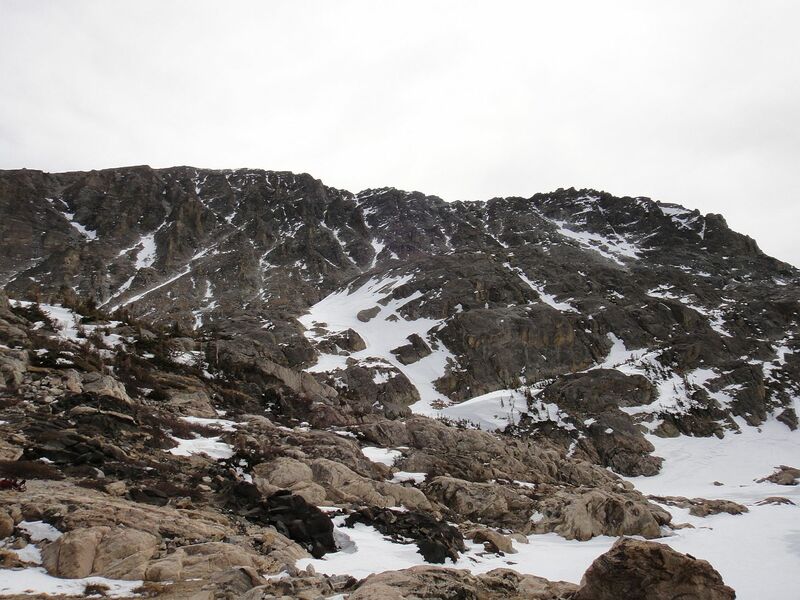 I would look up these steep snowfields, assess the snow pack and curse, rest briefly, and then head up. 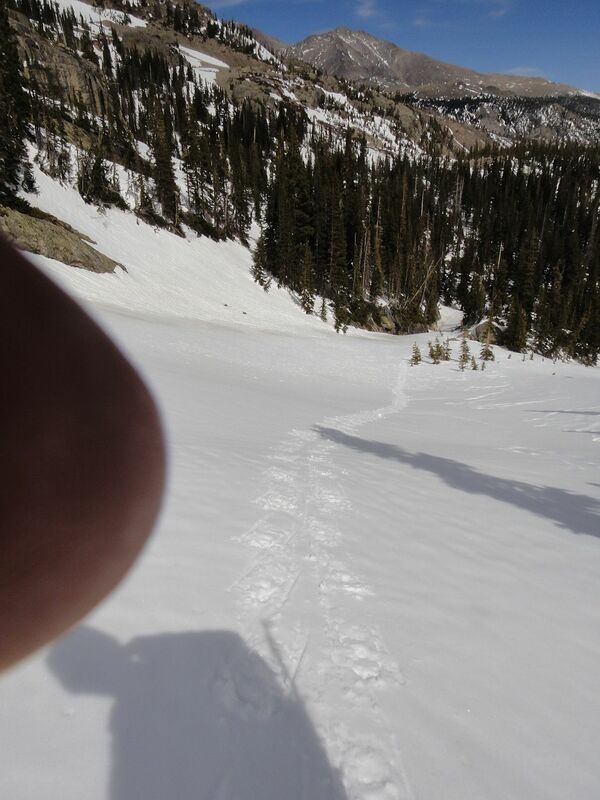 This was the first time I used my snow shoes on really steep stuff, and they performed admirably. 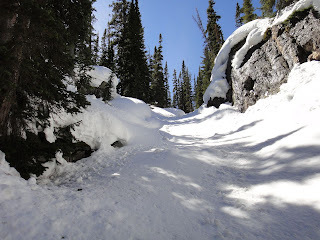 I had my ice axe in hand so I could self arrest in case I did slip and fall, but my feet didn't slip once on the way up or down. 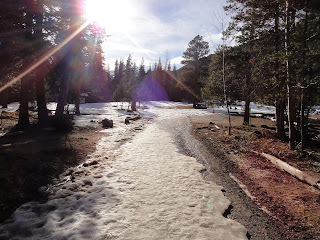 As I got closer to the lake and higher in altitude, the snow firmed up quite a bit, even in full sun. I stopped for a rest and some food before tackling this slope near the lake. Oops, got my finger in there. This was taken slightly east of the lake, looking down at the spot of the previous photo. 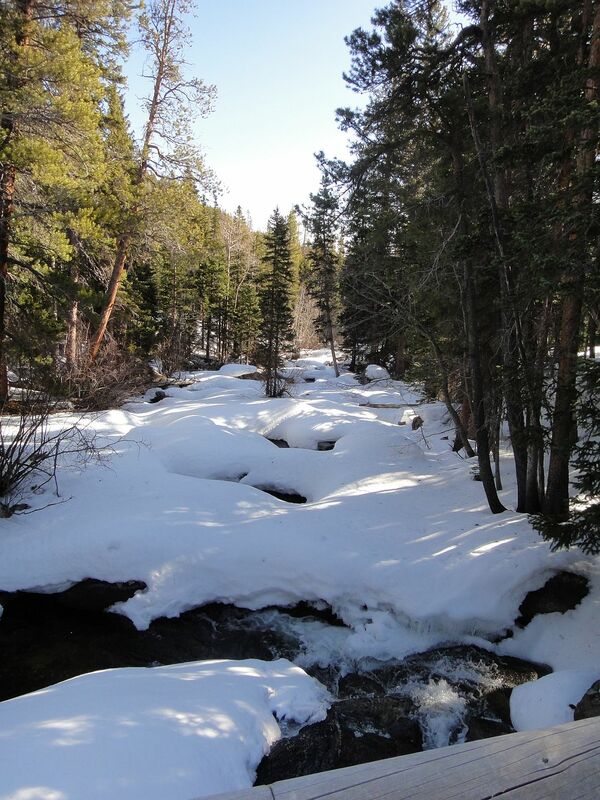 These pictures don't really capture the scope of it, everything covered in snow and steep snow at that. More than once I found myself thinking 'this is a place where you definitely don't want to fall, because it is a long, long way down'. 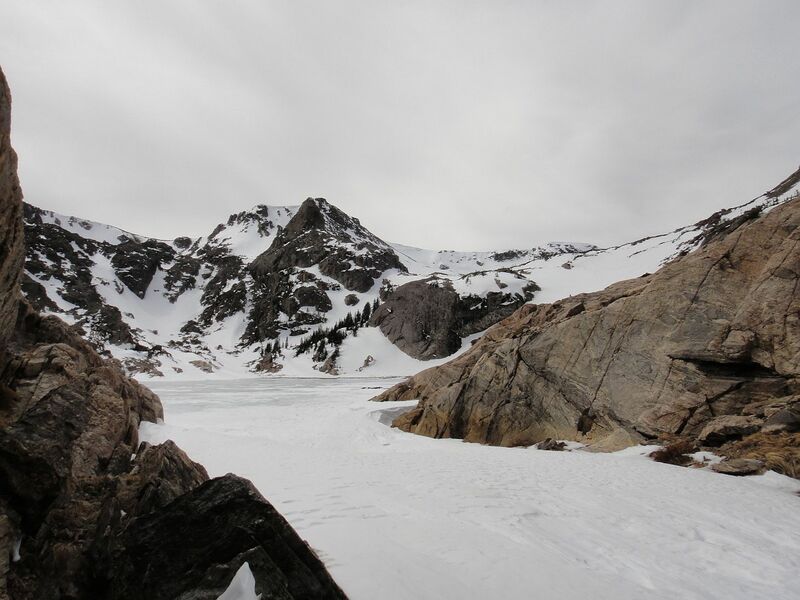 If you do venture up to some of these higher lakes in snow, an ice axe is a necessary tool. I had it ready in case I fell, and found myself using it to help keep my balance. 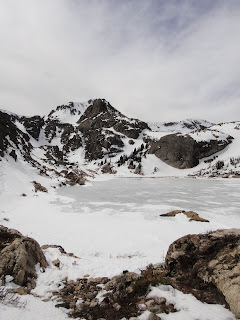 I was looking at my surroundings and decided that I was north of the trail proper, and that when I did hit the lake, I was going to be on the north side of the outlet. Soon enough, I was there, and much to my surprise, I was actually south of the trail by maybe 500 feet. 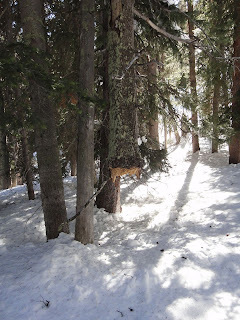 I walked over to where the trail ends, set my bag down, and took my snow shoes off. Time to take some pictures. Copeland as seen from Bluebird Lake. 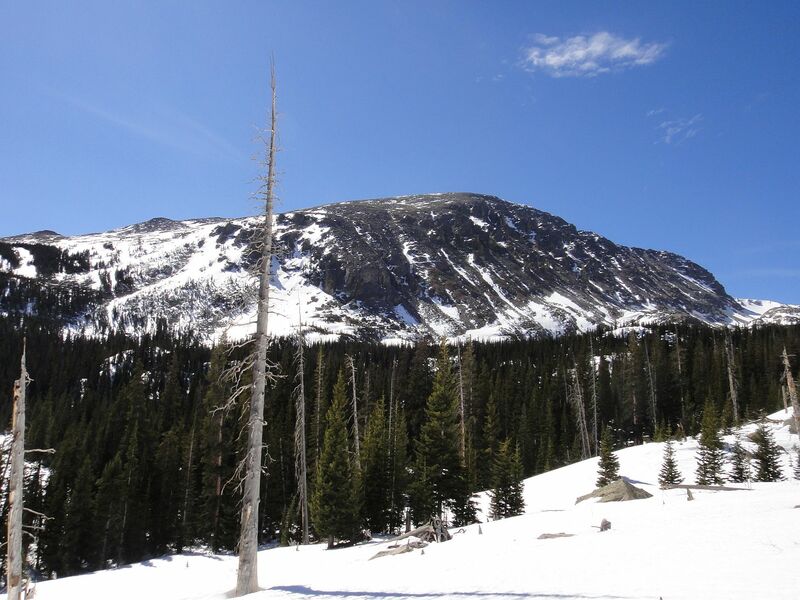 Panorama of the bowl, surrounded by Copeland, Ouzel, and Mahana. Ouzel Peak seen from the outlet of Bluebird Lake, a picture I have taken every time I have been to the lake. 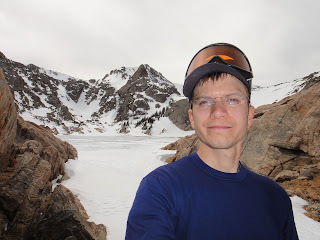 And yours truly at Bluebird Lake, 10978 feet. It took my five hours to get here, a bit longer than the three hours or so I remember it being in the summer. I was in better shape then, and didn't have to deal with snow or trail finding. And it was a tiring five hours. Since this lake is en route to some of the higher lakes and peaks in the area, I have been to it a number of times, and usually feel quite chipper when I arrive there. Not today! After taking in the sights for a little, I had to turn and head back. Here is where the fun started! 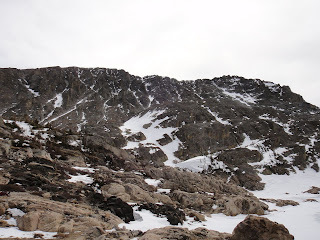 Since I was wearing snow pants and had my ice axe, I was able to glissade down some of these steep snow fields! Glissading, if you don't know, is basically skiing without skis or sledding without a sled in my case. 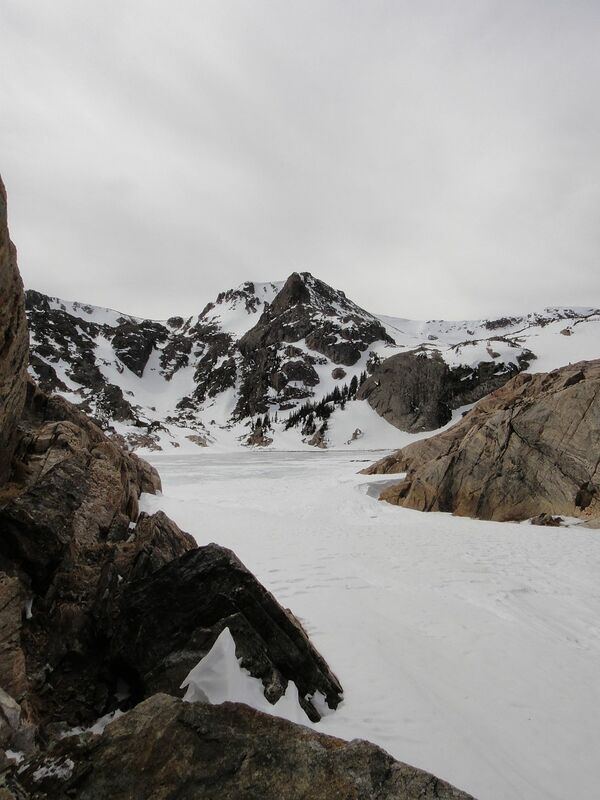 I would just kneel down, get the tip of my ice axe in, release my weight from the snowshoes, and off I'd go!!! I had one that was so perfect I wish someone was there to see or film it, and I actually ended up on my feet at the bottom of the hill! Like a boss. Looking back up on the way down. 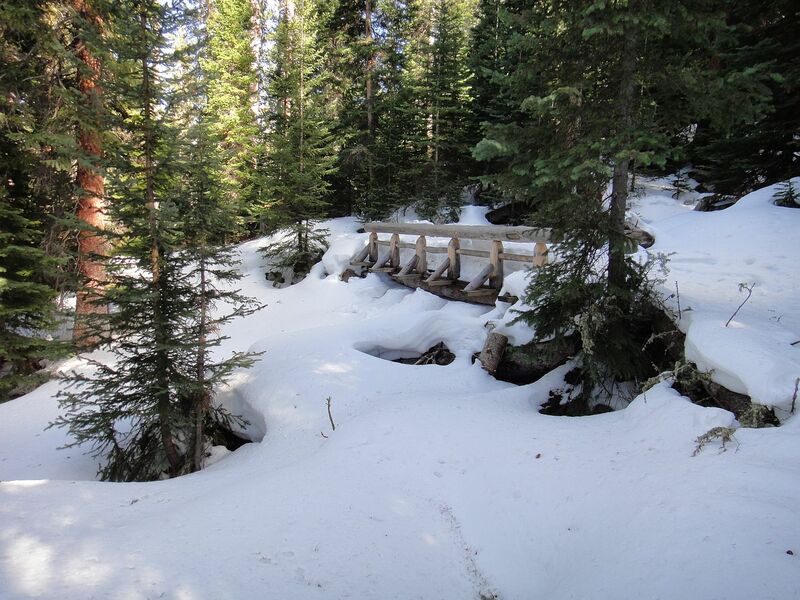 A bridge above Calypso Cascades showing two feet or so of packed snow. I was almost back to the summer trail head when I ran into the first people I saw during the day. I got back to the car around 530, giving me a nine hour day. By comparison, I can do this hike in five hours or less in the summer (though of course, that doesn't account for the additional two miles to go to and from the winter parking). 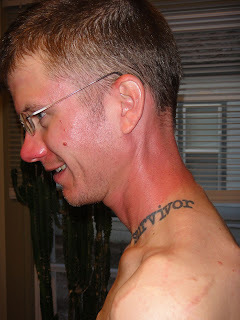 One thing that I learned on this hike is to make sure you have sun block! I thought I had some in my bag. It was only when I arrived there that I discovered I didn't. Here is what I looked like that evening. Pretty red. I am peeling alot today. It is a mistake I won't make again! Since I have done this hike several times now, I must say the difference in difficulty between summer and winter is enormous. Even during the summer, I would say this is a moderate plus to strenuous hike. Add in an additional two miles of distance, plus some gain, plus a total lack of a trail, plus snow conditions, and you have a very strenuous hike. I was thinking on the way down that this was one of the harder ones I have done. I would also recommend against doing this hike in the winter if you have not done it before in the summer. There are very few visual clues as to where you are going, and if you don't have a good idea of that, I could see trouble. There are many steep snow fields to complicate things, and a fall down one of these without the tools and knowledge to stop yourself could end in serious injury or death. That being said, if you are an adventurer and have the skills, tools, and fitness, do this hike! 7.4 miles one way from winter parking, 2478+ foot gain. Strenuous+. Snowshoes, ice axe, extra water, and sunblock required.